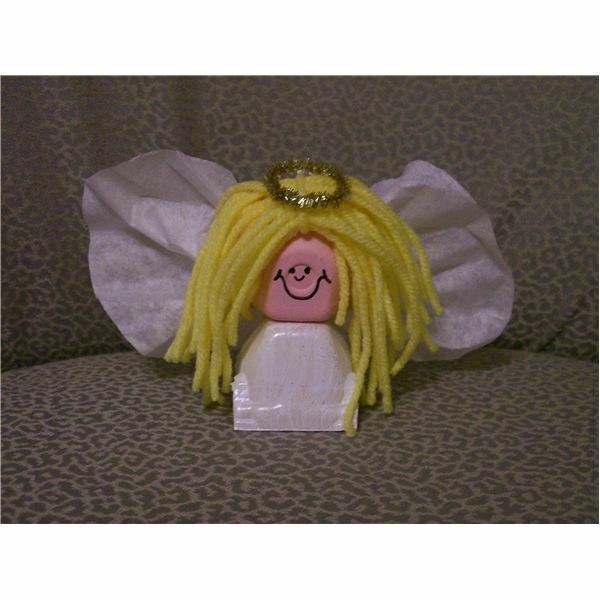 A Preschool Angel Craft That Will Surely Lift Your Spirits! Determine how much time you have for making the egg carton angel and prepare ahead of time the steps your students may not have time for. Plan another activity after painting to allow for drying time. 1. Cut the cups from the egg carton. Each child will need two egg cups for each angel. 2. Paint one egg cup white for the angel dress. If the egg carton is already white, thin the glue to a watery consistency and have the children paint the dress with glue. While the glue or paint is still wet, sprinkle with the glitter. Paint the other egg cup pink for the angel head. If the egg cup is already pink, there is no need to paint it. 3. While the paint and glue is drying, press the round coffee filter flat. Scrunch the center together and wrap with a twist tie. Fluff out each side of the coffee filter. These are your angel’s wings. 4. Draw the facial features on the bottom of the pink egg cup for your students. 5. Turn the white egg cup with the bottom side up and apply a dab of glue. The bottom of the egg cup is the top of the dress. Set the pink cup on it’s side on top of the dress. Make sure the face is right side up. To help stabilize the head, insert a brad fastener through the inside of the dress and into the pink head. Reach into the back of the head and open the brad fastener. 6. Apply glue to the top of the egg carton angel head. Cut several strands of yarn and drape over the head for the hair. 7. Cut a 3 inch piece of gold chenille stem and form it into a circle. Twist the ends together. Apply glue to one side of the ring and set it on the hair for the halo. 8. Apply glue to one side of the coffee filter angel wings, over the twist tie. Position the wings on the back of the angel. Lay the angel face down for a little while to allow the glue to dry enough to keep the wings from sliding off. With an angel lesson plan, you will be teaching your students that angels are messengers of God. The following stories in the Bible are a few that share the purpose of angels and would work well paired with this egg carton angel craft. Save egg carton scraps in a large container and let the kids experiment with additional egg carton crafts.